Seven West Media (SWM) is Australia’s leading multiple platform media company with a market-leading presence in broadcast television, magazine and newspaper publishing, and online. 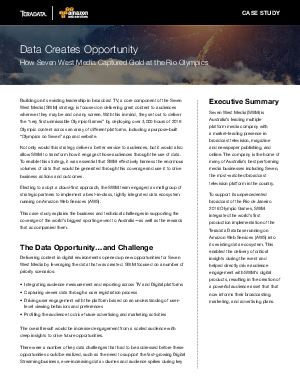 To support its unprecedented broadcast of the Rio de Janeiro 2016 Olympic Games, SWM integrated the world’s first production implementation of the Teradata Database running on Amazon Web Services (AWS) into its existing data ecosystem. This enabled the delivery of critical insights during the event and helped directly drive audience engagement with SWM’s digital products, resulting in the creation of a powerful audience asset that that now informs their broadcasting, marketing, and advertising plans. Find out how with in this case study.